This is the first installment of our Team Spotlight series and over the coming months, you’ll get to meet the people that comprise the PubNative family! 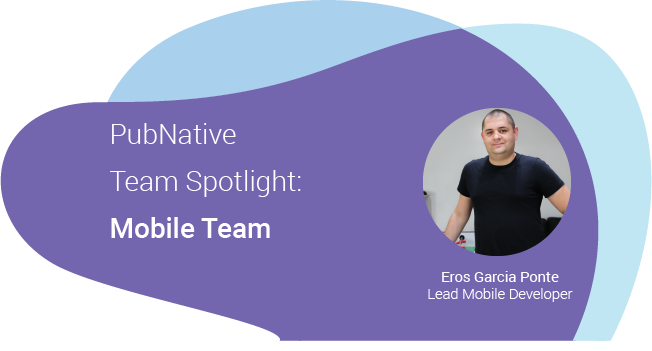 First up we talk to Eros Garcia Ponte, Lead Mobile Developer, to get an insight into life working on the Mobile Team at PubNative. How many people make up the Mobile Team and what is your role at PubNative? Currently, the Mobile Team consists of one Android Developer, one iOS Developer, and one QA Manager. Our team builds PubNative’s SDK products; we assist our publishers with the integration, develop new features and solve issues and bugs. We also experiment with different technologies such as AI and Machine Learning to see how far we can push and improve our products. A regular day for us involves answering queries from the publishers, which is our first priority; fixing bugs, working on our HyBid SDK product and ensuring that the code is kept up-to-date. How has PubNative grown since you started working here? I began working at PubNative in June 2017 and since then, the focus of the company has completely changed, along with our products! When I started, the Mobile Team worked on the mediation SDK and now that has been completely phased out. Today, our main product is our header bidding SDK and over the years we’ve done so many experiments to see what the latest trends in the market are how we can adapt. What do you like most about working at PubNative? I really like the company structure as it’s very horizontal and even if there are clear lead roles, all members are reachable. It’s easy to have conversations and talk about products/features or issues you might have. The company is very open in terms of innovation and when something new is coming, you get the time to experiment and get helpful input from the Product Managers and often the CEO. The colleagues are also super cool, and the beers on Friday 😉 It’s easy to hang out with people from the office as we have similar interests so it’s great to have a social life also where you work. If you could pick up a new skill instantly, what would it be? Data science, definitely, because it’s a very new trend in the market and there’s a big requirement for people with these skills. It is something that compliments other expertise, so it’s not like I would stop being a Mobile Developer, and it would bring great value to me personally and to the company. Which do you prefer: iOS or Android? Even though I prefer using iOS devices, I prefer developing for Android! The ecosystem is much more open and it’s easier to find collaboration and libraries. You can do far more with your device and you have more control than with iOS. However, recently Android has been more restrictive and Apple has been allowing more so they are becoming more equal, but I still think that you have more freedom with Android. What’s your favorite place to go in Berlin? I would say hanging out with friends at the canals in Kreuzberg, playing ping-pong and watching people pass by. Thanks to Eros for sharing with us and stay tuned for the next edition of our Team Spotlight series! Check out our other posts here and get in touch with us by sending an email to marketing@pubnative.net.